In her senior season, Boulier had 6G and 17A for 23Pts. She was also a third team All-ECAC Hockey Selection. 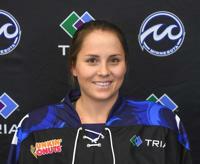 Boulier played her first two seasons in the National Women's Hockey league as a member of the Connecticut Whale before joining the Whitecaps. @bruce_crowley @WhitecapsHockey Thanks Bruce! Such a fun day.